"Designed specifically for Speed Climbing"
PERFECT FOR SCHOOLS, MALLS, SPECIAL EVENTS, TRAINING, AND RACING! Climbing gyms are an area that are prone to many nuances and is a harsh environment Our Speed Climbing Timer system "CLIMBTime² (squared)", is designed to be used as a normal part of the everyday gym operation, and not only for competition use. We have many systems Globally, in various climbing gyms for fun, local, regional, and National competitions. Our system has also been used in IFSC International competitions. The targets have no moving parts to wear out, or laser light sensors to clean. They are similar to a smart phone that detect touch not pressure, so wall vibration will not trigger the finish switch like typical piezo based systems that need to be calibrated down causing occasional non registered hits to the finish switch by the climbers. Also finish target will not activate if struck with most objects, such as a climbing rope, harness, chalk bag, etc., yet will detect the slightest human presence, even through gloves, or chalk laden hands. Our Timing systems are crystal based timing for accuracy, and timer to timer consistency. Our Timing system is also scalable, to allow you to grow into a full competition system over time without the larger initial investment of a full competition system, as each speed route system can be used independently. The competition controller connects two individual routes together to form a controlled racing system. Each timer route can be used independently for training, parties, or everyday gym use. 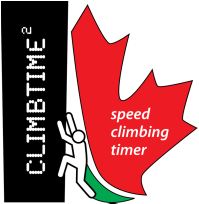 Climbtime² systems are IFSC approved supplier, and meet IFSC requirements, including anticipated false start to 0.1 second, and IFSC\Olympic tonal start sequence low tone, low tone, high tone start sequence. Competition controller will also allow for training mode for speed training, and for reaction time training. The controller will measure the climbers reaction time and determine if a climber started early by a guess (lucky start). Human reaction time cannot be any faster than 0.1sec - the system will determine if the climber started within 0.1sec of a releasing start. The competition controller will also detect false start if a climber started climbing before the released the start.